Communication is an essential component for high-quality healthcare interactions. While the benefits of patient-practitioner communication have been well documented [1-2], the importance of interpractitioner and clinician-researcher communication must also be considered. The field of prosthetics and orthotics is an excellent example of interdisciplinary care, with wide participation from within and outside the typical healthcare environment. This mix of consumers, physicians, nurses, therapists, prosthetists, orthotists, engineers, psychologists, business/industrial sector representatives, and other stakeholders brings together a breadth of terminology that can lead to communication errors and reduced decision-making effectiveness. The impact of varying terminology in the assistive device sector is enhanced when moving into the global arena. Assistive device terminology is a dynamic and constantly evolving area. Innovation brings new ideas and produces new terms to describe these advances efficiently. Regionalization is to be expected with these terms and definitions. While attempts have been made to standardize language, dating from the first dictionaries to the Académie française (i.e., the official authority established in 1635 to standardize the French language) to the International Organization for Standardization (ISO) Technical Committee on Prosthetics and Orthotics Nomenclature and Terminology (TC 168), society's evolving communication needs make standardization a difficult and continuous task. A combination of standardization and description is needed to build on a common communication base and encourage an understanding of regionalized terminology. 1. Acronyms: Acronyms can create confusion within an interdisciplinary care environment because similar acronyms often refer to widely different things or simply because one profession has never been exposed to another profession's acronym(s). While acronyms commonly serve to abbreviate lengthy words and phrases for industry insiders, they needlessly complicate the understanding of noninsiders peering into the profession. An example of the complexity of acronyms follows; however, the number of acronyms in this editorial serves as another example of this issue. 2. International differences in terminology: In the United States, the acronym PTB means patella-tendon-bearing, which refers to one of several prosthetic socket design options for the transtibial prosthesis user. However, the acronym PTS, a French acronym translating to prosthese-tibiale-supracondylienne and coined by Guy Fajal in 1963, is still widely used internationally. In the United States, the addition of supracondylar (SC) trimlines to a PTB socket may appear in acronym form as PTB-SC, whereas PTS may also be used and is accurate. Additionally, PTS may also describe the addition of supracondylar trimlines to non-PTB sockets. For people outside the clinical prosthetics area, PTB can refer to pulmonary tuberculosis, physical trade balance, or powers that be. These differences in terminology, based partly in language differences, lead to differing acronyms and ultimately to confusion. 3. Societal acceptance: Possibly the best example of social influence on terminology was the shift in the North American professional community away from the term "stump" in exchange for "residual limb." Ironically, many patients/clients still communicate to their prosthetist using the term stump. Interestingly, various scientific journals have recommended authors to use the term residual limb; however, the ISO standard term is stump. 4. Crossprofessional adoption of terminology: As an example of crossprofessional terminology adoption, in engineering, hydrostatics refers to the study of fluids in stable equilibrium either in closed or open conditions. In prosthetic socket design, the term hydrostatic describes a socket in which a distraction force encourages the residual limb's tissues and fluids to migrate distally to prevent distal migration of the skeletal elements because of the incompressible nature of fluids . The body's fluids cannot remain in such a position, and pseudoclosed aspects of the system have wide ranges of alteration under some conditions (e.g., muscles or blood vessels at rest compared with shivering, exercising). Such a system cannot be a true hydrostatic design, which again leads to confusion. 5. Choice of terms based on lack of a clear definition: To stay with prosthetic socket technology examples, the term socket can be a source of disagreement. Some refer to the part of a prosthesis that connects the human body to the prosthesis as a socket, while others refer to it as an interface. The advent of direct skeletal attachment has affected this debate, now making sockets a potential interface option. This issue raises new questions: Are sets of terms synonymous? How are types and sets of devices stratified or classified? These are merely a few examples of why it is crucial that attempts be made to standardize prosthetic and orthotic terminology. This editorial summarizes various resources and initiatives that implement a global view on enhancing interprofessional and intercultural communication. Wikipedia (Figure 1) has become a primary source for online encyclopedic information . This resource relies on individuals contributing and editing the terms and content, thereby providing a large body of information but without the central editing control present in traditional encyclopedias. The quality of the Wikipedia entries remains a point of contention; however, recent studies have supported the overall quality of this global community-based resource . Wikipedia also benefits from timely revision of content, which is difficult to achieve with traditional encyclopedia structures. 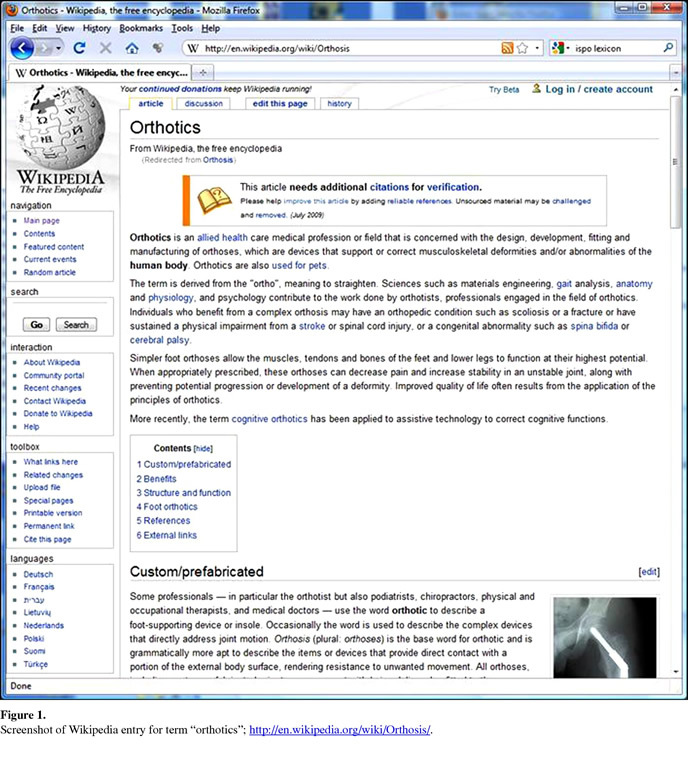 An additional advantage of Wikipedia is that, once an entry is on-screen, the user can select other languages for the content. However, each language entry is created and edited independently (i.e., for the same term, pages in different languages could have different content). In relation to prosthetics and orthotics, entries for many discipline-specific terms are currently not available. For example, the common prosthetic term PTB, or patella-tendon-bearing, does not have a Wikipedia entry. As well, the number of editors for prosthetic and orthotic topics is relatively small. Recent research supports the relationship between higher quality and accuracy and a larger number of edits and editors and intensity of cooperative behavior [6-7]. In the future, the Wikipedia approach for providing detailed, multilingual, encyclopedic information on prosthetic and orthotic terminology could emerge. However, this outcome would require a sustained effort from prosthetic and orthotic professionals throughout the world. A coordinated effort between global and national organizations could facilitate this process. An overlooked, but generally accessible, method for quickly searching for definitions to help understand words and phrases is to use Web search features. 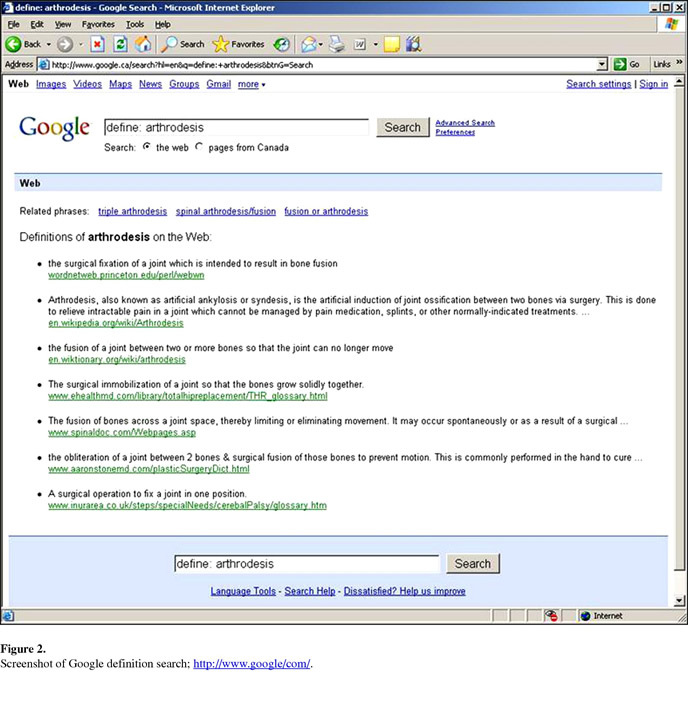 For example, http://www.google.com has a feature in which "define: term or phrase" can be entered into the search box to display a list of definitions from a variety of sources on the Internet (Figure 2). While the list of various sources helps the user understand the many ways that a term or phrase can be used, it may be difficult to decide on the best definition for the search objective. As with Wikipedia, many prosthetic and orthotic terms are not available with this resource. For the rehabilitation professional or student, browser definition search is valuable for finding quick definitions for related biological, biomechanical, and healthcare terms. As an international multidisciplinary society for prosthetic and orthotic care, the International Society for Prosthetics and Orthotics (ISPO) recognizes the importance of a common base for communicating between stakeholders in the healthcare sector and across geographical and cultural areas. 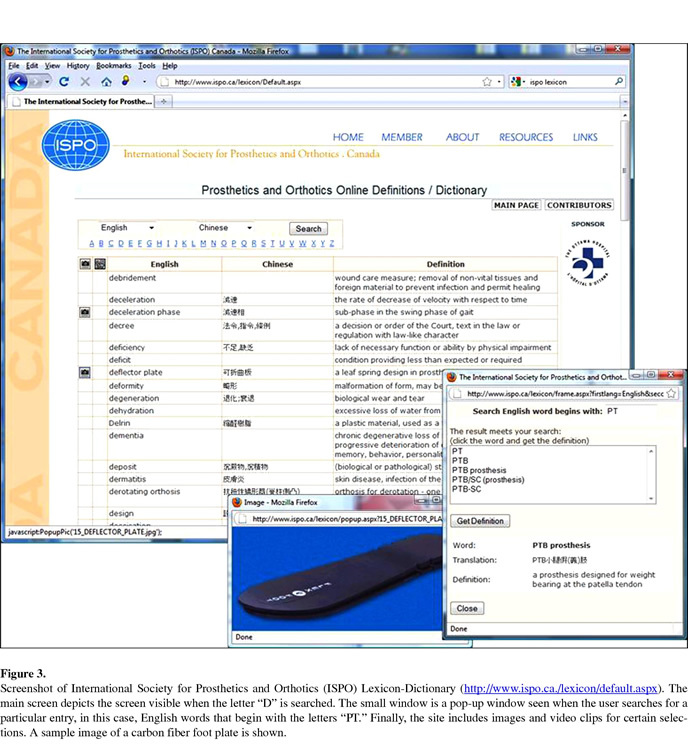 In 2001, ISPO Canada supported a collaboration between Edward Lemaire, Wieland Kaphingst, and Fangwei Zeng to develop a Web-based resource for prosthetic and orthotic terms and definitions . The database of approximately 1,000 terms in English and German had been developed by Wieland Kaphingst over the past 20 years to assist with translation of technical documents between the two languages. The initial objective was to create a Web-based interface for this database that would allow people to easily search by English and German words, browse alphabetically, and quickly see the terms and definitions in a table. This lexicon-dictionary would include scientific and colloquial terms since the objective was to help people communicate, thereby requiring the inclusion of nonscientific/standardized terms that are commonly used in regional practice. Upon completion and release of the ISPO Lexicon-Dictionary (Figure 3), requests were made to have the database of terms available in other languages and to recognize standard terminology. Languages were added through volunteer work by various ISPO members and societies, supported in some instances by academic institutions. Currently, seven languages are included in the application: Chinese (Aaron Leung, Lingzhen Dong), English (Wieland Kaphingst, Edward Lemaire), French (Pierre Huet), German (Wieland Kaphingst, René Baumgartner, Wilfred Raab), Spanish (Monica Castaneda, Heinz Trebbin), Turkish (Serap Alsancak), and Vietnamese (Wilfred Raab, Pham Thuy). All inclusions in the database are peer-reviewed. Technically, the initial design facilitated addition of new languages by using a spreadsheet to maintain the core database (i.e., facilitating collaboration and maintenance by the various contributors and ease of integration into the Web Structured Query Language database) and using an interface that allowed ease of selection between any two languages. The Web design allowed the site to function across common Web browsers and to work with low-bandwidth and small screen computer displays. This facilitated access for people in developing countries. Difficulties were encountered with integrating the Chinese translation since Chinese characters cannot be directly mapped to the English alphabet, and initial technical issues with integrating the various character sets into one Web page were resolved. To provide an alphabetic search, the developers defined pinyin translations that provide phonetic spelling of the Chinese words. Pinyin can be defined as "spelling sound" or "spelled sound." The value of terminology standardization is recognized as an important direction for global communication. ISO published terminology standards between 1989 and 2007. The standards documents are available for purchase from the ISO. The ISO working group (TC-168) has completed a full review of the English terms and definitions in the ISPO database. The next revision of the Web site will include all ISO terminology and the updated definitions. A revised Web site design will identify the ISO standard terminology and allow people to hyperlink to the standard term from nonstandard words. This feature will help promote the use of international standard terminology and thereby enhance intercountry communication. In addition to improving and expanding the Lexicon-Dictionary database, researchers will add new translations through continued international collaboration. The ISPO Lexicon-Dictionary remains a freely accessible resource for the prosthetics and orthotics community. This initiative can be considered a good example of grassroots success and collaboration within the global village. Recognizing the need to facilitate informed consumerism of prosthetic, orthotic, and other medical/rehabilitative literature, the American Academy of Orthotists and Prosthetists (AAOP) commissioned its Standards and Protocols Committee to develop a research glossary in 2008 (Figure 4). The glossary contains 140 commonly used research terms, including study design, statistical, bias, funding agency terms, and more. Links to sources are available for each definition. The glossary is not intended to be an inclusive dictionary but rather an easy-to-reach reference source that supports clinicians reading research articles, orthotic/prosthetic residents beginning research projects, etc. 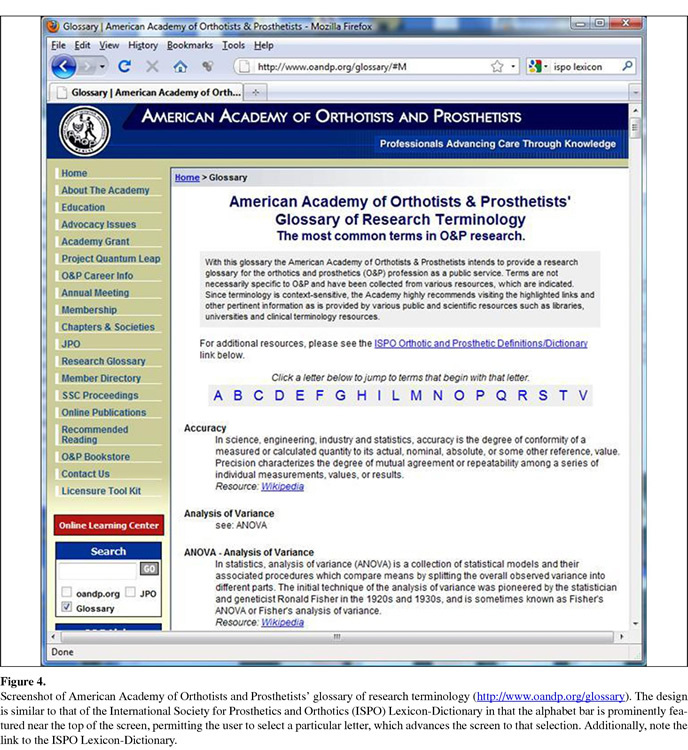 The AAOP research glossary Web link is a public domain resource . Numerous textbook resources are available that include definitions for prosthetic and orthotic terms. In preferable cases, textbook glossary definitions may be derived by a large multidisciplinary group of experts. Definitions from these sources sometimes differ from those found in the peer-reviewed literature. In the United States, a leading text for prosthetic terminology is the Atlas of Amputations and Limb Deficiencies: Surgical, Prosthetic, and Rehabilitation Principles  and one for orthotic terminology is the AAOS Atlas of Orthoses and Assistive Devices . A list of prosthetic and orthotic text resources (Figure 5) is available on the U.S. Department of Education sponsored "Demonstration Project on Prosthetics and Orthotics" Web site, which is also a resource in the public domain . The global flow of people and information continues to increase. The information technology sector is a good example of borderless working groups working together to achieve technical, personnel, and strategic objectives. Standards greatly benefit this industry both in the technical ability to communicate internationally and the interpersonal ability to be understood. In the area of prosthetic and orthotics, resources have become available to achieve a similar level of international understanding. The current Web-based resources are being used by students, educators, clinicians, and researchers to understand existing documents and create new correspondence that is globally comprehensible. We are now at the start of a move toward implementing standards to further enhance communication quality. The resulting potential for enhanced learning and decreased healthcare errors will lead to better care for people within the global village. 1. Onga LML, De Haesa JC, Hoosa AM, Lammesb FB. Doctor-patient communication: A review of the literature. Soc Sci Med. 1995;40(7):903-18. 2. Mauksch LB, Dugdale DC, Dodson S, Epstein R. Relationship, communication, and efficiency in the medical encounter: Creating a clinical model from a literature review. Arch Intern Med. 2008;168(13): 1137-95. 3. Redhead RG . Total surface bearing self suspending above-knee sockets. Prosthet Orthot Int. 1979;3(3): 126-36. 5. Giles J. Internet encyclopaedias go head to head. Nature. 2005;438(7070):900-901. 6. Wilkinson DM, Huberman BA. Cooperation and quality in Wikipedia. In: Proceedings of the 2007 International Symposium on Wikis; 2007 Oct 21-23; Montreal, Canada. Wiki Sym. 2007. p. 157-64. 7. Kittur A, Kraut RE. Harnessing the wisdom of crowds in Wikipedia: Quality through coordination. In: Proceedings of the ACM 2008 Conference on Computer Supported Cooperative Work; 2008 Nov 8-12; San Diego (California). New York (NY): The Association for Computing Machinery; 2008. p. 37-46. 8. Kaphingst W, Baumgartner R, Raab W. Prosthetics and Orthotics Online Definitions/Dictionary [Internet]. Ottawa (Canada): International Society for Prosthetics and Orthotics [cited 2009 Sep 9]. Available from: http://www.ispo.ca/lexicon/. 10. Smith DG , Michael JW, Bowker JH; American Academy of Orthopaedic Surgeons. Atlas of amputations and limb deficiencies: Surgical, prosthetic, and rehabilitation principles. 3rd ed. Rosemont (IL): American Academy of Orthopaedic Surgeons; 2004. 11. Hsu JD, Michael JW, Fisk JR; American Academy of Orthopaedic Surgeons. Atlas of orthoses and assistive devices. 4th ed. Philadelphia (PA): Mosby/Elsevier; 2008.